The Chico Wildflower Century is a major club ride out of Chico, a great college and cycling community. Multiple routes are available, including the Wildcat 125 and 100, the traditional Wildflower 100 with less climbing, and shorter options. The Wildcat 100 route is the same as the Wildcat 125, except the latter adds a flat orchard loop at the end. 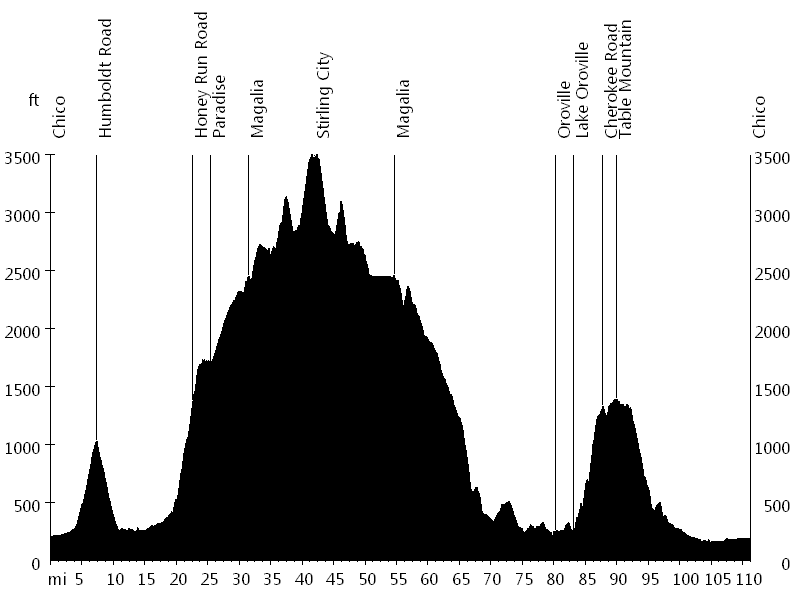 The Wildflower 100 route is the same as the Wildcat 125, except the latter adds the climb from Paradise to Stirling City. All routes start at the Silver Dollar Fairgrounds. 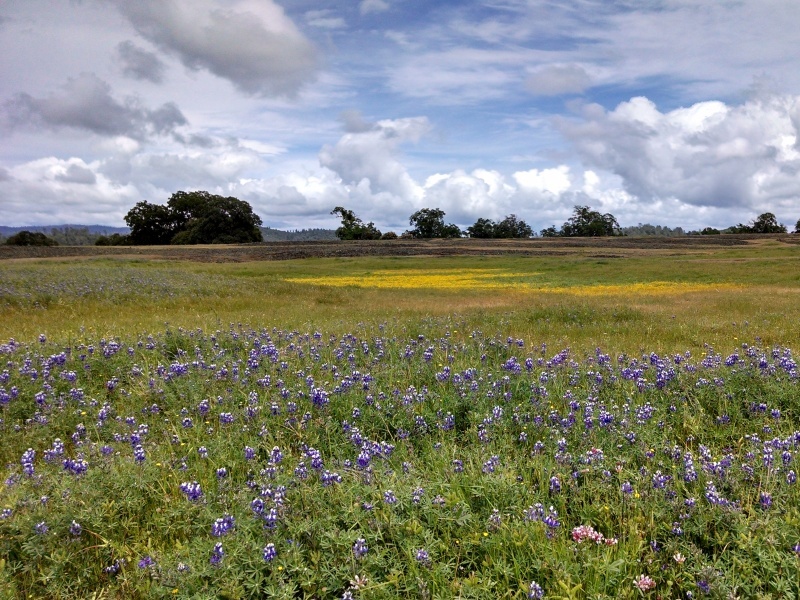 After leaving Chico, the 100 and 125 mile routes climb Humboldt Road and descend Deer Creek Highway. Then they head to Honey Run Road, which leads up to the town of Paradise. The Wildcat routes continue on climbing, on a bike path to Magalia and on Coutolence Road and Skyway Road to Stirling City (3,500 feet). The descent from Stirling City follows Skyway Road to Magalia and Pentz Road to the Table Mountain loop. Wheelock Road, Coal Canyon Road, and Table Mountain Road lead to Oroville. After passing Lake Oroville, Cherokee Road climbs Table Mountain. Durham-Pentz Road, Oroville-Chico Highway, and the Midway bike path finally lead back to the Silver Dollar Fairgrounds. Chico Velo Cycling Club put on a very well organized event. The Wildflower Century strives to become the first major century to achieve a zero waste stream to the landfill via recycling and compost (92% of waste were actually diverted this year). I relied on the weather forecast, which was a mistake. In Stirling City it started raining and the temperature dropped close to freezing. The long descent and wind made matters worse. Eventually I saw Chuck's Place and went inside until my body stopped shaking. Here I met Krishna from Roseville, and we rode together for a while. Later I ran into Erica and Mayumi from the Bay Area.